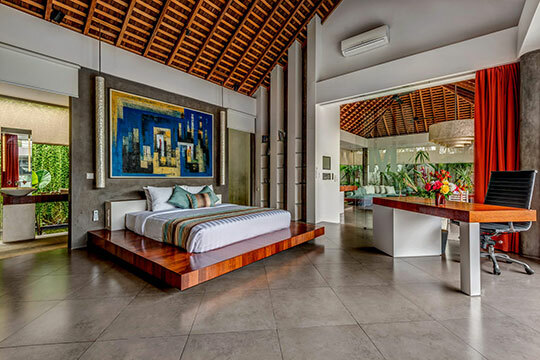 The bedrooms at Villa Banyu exude pure luxury. The ground floor contains three bedrooms that provide gorgeous views of the pool and koi pond through gleaming glass doors. Each is furnished with comfortable king-sized beds mounted on wide, solid-wood platforms. 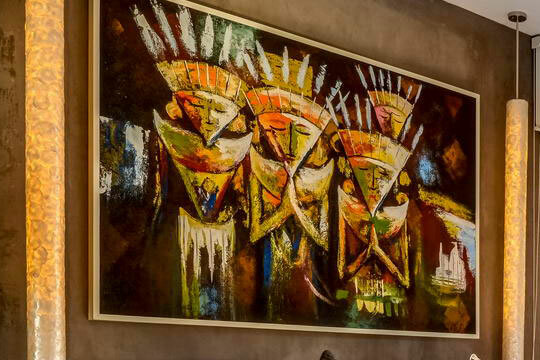 Vibrant paintings and convenient little seating areas complete the feeling of boutique luxury. The rooms also come with flat screen TV’s with DVD players and full air conditioning. 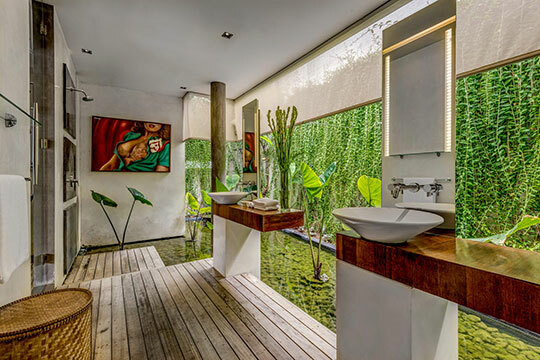 The ensuite bathrooms at Villa Banyu were finished with the finest specifications and are truly something to behold. The rainfall showers were designed and positioned in a way that provides guests with striking views of the fishpond and charming greenery that surrounds the villa. No one will fault you for taking your sweet time, so feel free to relax in these beautifully unique bathrooms. The last bedroom is located on the first level. It also has an ensuite and is furnished with two twin beds that are perfect for younger children. Designed in an open-plan style, the living and dining areas are circled by the unique koi fishpond, which provides guests with charming views of the glistening water from every angle. The dining table comfortably seats 10-people and provides a sumptuous setting for a yummy meal with close family and friends. Nestled in the corner of this stunning property you’ll find a plush L-shaped sofa that simply beckons you to recline, book or brew in hand against a background of hanging flowers. The water gardens are a gorgeous feature and as such, the villa was aptly named; Banyu means water in Balinese. Beside the pool is the main fishpond, plush with lilies and shaded areas to escape the sun. The pool itself is an expansive oasis providing relief from the tropical warmth. Take the time to relax in the poolside bale and enjoy your choice of music on the zone sensitive, built-in, surround-sound system. Or make your way to the second floor and you’ll find a setting for some truly extravagant entertainment. Of course, the games room is completed with a snooker table and a bar for whipping up drinks. The villa manager will be there to greet you and make your stay as smooth and comfortable as possible. They can assist you with arranging tours around the island or in-villa treatments like massages, or can simply help with any queries you may have. Banyu Villa is also staffed with a butler, housekeeper, pool attendant and gardener. All the staff members at Banyu Villa are extremely professional and will ensure you are well looked after.